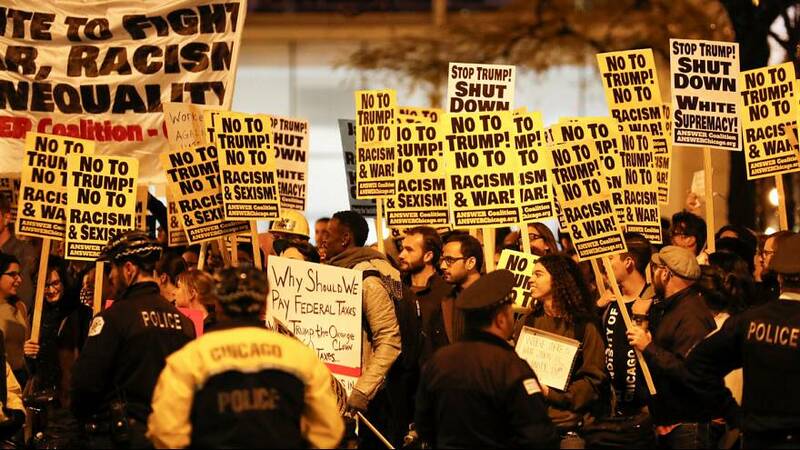 Angry Americans have taken to the streets in New York and cities across the United States, following the election of Donald Trump to the White House. The protests were sparked by the campaign rhetoric used by the Republican around, abortion rights, immigrants, and his pledge to build a wall along the border with Mexico. In Chicago roughly a thousand headed for the Trump International Hotel while chanting against racism and white nationalism. Within hours of the election result being announced the hashtag #NotMyPresident spread among half a million Twitter users. Earlier hundreds of high school and college students had walked out of classes in Austen Seattle and Los Angeles. Many of the protesters were students and members of the so-called “ Dreamers” generation, children whose parents entered the US with them illegally and who fear deportation under a Trump administration. The organisers say further protests are planned for the coming days.